Eating cereals in the morning instead of taking the time to brew tea and cook eggs, healthy green fritters or other delicious foods that might tempt us more than oatmeal or corn flakes with yogurt or milk, but are somewhat time-consuming, may prove more beneficial for our health than we can imagine. There are actual health benefits to eating cereals in the morning, provided, of course, we make healthy choices that meet our body’s nutritional requirements. Despite dietitians urging us to substitute breakfast cereals for healthier options such as carrot sticks and apple slices, scrambled eggs with salmon and greens, turkey or chicken sandwiches with goat cheese or green fritters, we don’t always have the time, ingredients or budget for everyday breakfast extravaganzas. Having a bowl of cereals every now and then, however, is not only considerably less time-consuming and cheap, but also unbelievably healthy. The trick is to go for whole grain cereals or multi-grain cereals with at least 40-50% whole grains, without artificial sweeteners, too much added sugars, texture-enhancing chemicals or dangerous dyes. Whole grain oats, barley, rye, brown rice and wheat are all healthy breakfast cereal options for anyone looking to have a power-breakfast. And if you feel you need to add a bit of sweetness, more crunchiness or nuttiness to your plain whole grain breakfast cereals, you can top them with any fruits, nuts and seeds you crave to turn them into such a rich, nutritious, colorful and healthy breakfast that even the most fastidious diner will find hard to resist. 1) Help with normal bowel movements and prevent constipation. Whole grain breakfast cereals are a rich source of dietary fiber, indigestible plant material that gives bulk to stools, facilitating their passing through the digestive system. Bulkier stools as a result of fiber-rich foods means they get expelled at regular intervals, so there is no risk of getting constipated. Avoiding constipation is ideal for proper hemorrhoids management; easy, regular bowel movements don’t put any unnecessary strain on the already swollen and distended blood vessels. Just remember that fiber needs liquids to do its magic. 2) Aid digestion. As mentioned above, the healthiest breakfast cereals are whole grains because whole grains are an excellent source of dietary fiber. In addition to helping us achieve normal bowel movements, dietary fiber also aids digestion. And it does this in two ways: first, it normalizes intestinal transit time (so no more constipation), and secondly, it benefits the good bacteria in our digestive tract because it contains prebiotics, natural plant compounds that the good bacteria in our digestive tract feeds on. Prebiotics are basically food for the good bacteria in our large intestine. For example, oatmeal is an excellent source of prebiotics (food for good gut bacteria), while some yogurt varieties are a great source of probiotics (containing live, beneficial gut bacteria). 3) Help maintain a healthy weight and lower LDL cholesterol. Whole grain breakfast cereals help us maintain a steady and healthy weight because they are rich in dietary fiber. Foods rich in dietary fiber such as whole grain cereals usually take longer to chew and eat and thus our brain has enough time to send out signals that we are full, so we do not overeat. In addition to this, because it remains virtually undigested, the dietary fiber in breakfast cereals does not add calories to our diet, which means it does not contribute to weight gain; it just fills us. Even more, it has been shown that fiber prevents some of the fat from the foods we eat from being absorbed at the intestinal level, making it easier for us to maintain a steady weight and even lose weight. This also indirectly contributes to lowering LDL (bad) cholesterol levels. 4) Provide a good calorie intake for boosting energy. 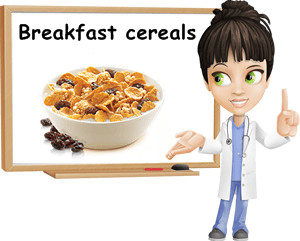 Breakfast cereals are generally high in calories (or kilocalories). Calories (or kilocalories) measure the energy we get from the foods we eat and use to breathe, move, think and perform all kinds of physical and mental activities. 100 g of breakfast cereals of the healthy kind should have somewhere between 235-400 kcal, which is quite a lot. However, because breakfast cereals are always puffed or expanded or chewy, we generally eat no more than 40-50 grams once (recommended serving sized vary between 35-45 g). So although they are rich in calories, the fact that we eat such small portions, but still get a good calorie intake to help keep us moving is what makes breakfast cereals good for us. 5) Offer a good supply of vitamins and dietary minerals. Whole grain is defined as something unprocessed, in its natural, unaltered state. And cereals in their unprocessed, unaltered state contain generous amounts of vitamins and dietary minerals, especially magnesium, potassium, iron, phosphorus and B vitamins, to name a few. These nutrients get absorbed at the intestinal level and, after getting released into our bloodstream, they go where our body needs them. Magnesium, for instance, goes to our muscles, including the biggest one (the heart) to help regulate muscle contractions and to our bones to help make them stronger. Iron helps get oxygen to our blood cells and muscle cells from the lungs, accounting of good energy levels and so on. Whole grain breakfast cereals are ideal for a good vitamin and mineral intake, while enriched or fortified breakfast cereals are second best. 6) Constitute a satiating and heart-friendly morning meal option. Another reason why eating cereals in the morning is beneficial for our health is the fact that they are satiating. Both the calories and the dietary fiber keep us full for longer so our body has a steady energy supply for up to several hours. Since we don’t get hungry almost immediately, we tend to be calmer and concentrate better on our morning activities. However, if you choose plain breakfast cereal varieties such as oatmeal, it is important to add nuts or seeds to it so you get both carbohydrates and protein and healthy fats that your body needs to function properly. Milk or plain yogurt are also great for pairing with your morning cereals. How to make your breakfast cereals even healthier? Well, it is fairly easy to make a bowl of whole grain cereals healthy and fun. You just add fresh or dried fruit for extra vitamins and minerals, nuts and seeds for dietary fiber, protein and healthy fatty acids, or eat them with goat milk (the healthiest type of milk) or plain yogurt for probiotics (healthy bacteria for your gut) to promote digestive health. While nuts and seeds are always a good option, unless you are allergic, dried fruit are sometimes difficult to choose. Figs, pears, raisins, apricots, peaches, plums or dates are often the best options because they are sun-dried or mechanically dried. Bananas, kiwifruit, papaya and so on are more likely candied, while berries and raisins will most likely have added sugars or some form of chemicals which does not recommend them.